Pete Scholey, ex Royal Artillery and Parachute Regiment, possessed the necessary mix of courage and coolness under extreme pressure. He joined the SAS in 1963 and eventually hung up his boots in 1986, 23 years later. This book describes his life as a soldier, giving first-hand accounts of the many actions he was involved in. To survive over 20 years of active service in the SAS takes a particular kind of man. Pete Scholey, ex Royal Artillery and Parachute Regiment, possessed the necessary mix of courage and coolness under extreme pressure. He joined the SAS in 1963 and eventually hung up his boots in 1986, 23 years later. During that time he served - often covertly - in many of the world's trouble spots. In "The Joker", he vividly describes life as a soldier at the sharp end, giving first-hand accounts of the many actions he was involved in, from jungle warfare in Borneo and desert fighting in Aden and Oman to his part in the setting up of the counter-terrorist team that was successfully used in the siege of the Iranian Embassy in 1980. He outlines the operational skills that took his teams deep into enemy territory without ever being captured, reveals how they achieved their objectives and describes the humour that he managed to find in the most hair-raising moments. 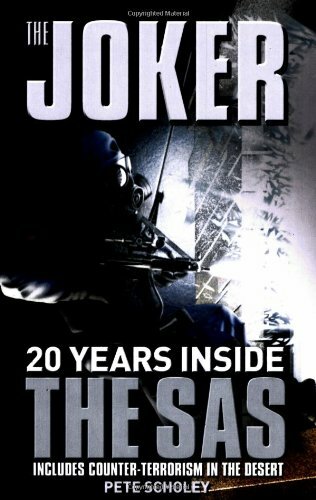 An exciting account of some of this century's most sensitive and dangerous operations, told by a born raconteur, "The Joker" also offers a genuine insight into the toughness, professionalism and camaraderie that has made the SAS the world's premier fighting force.